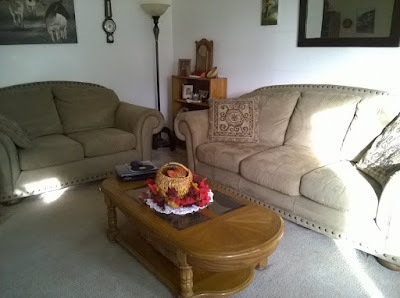 Tomorrow between 8am and 10 am, I am having my sofa and loveseat professionally cleaned. $178. I checked around and this seemed to be the comparable price so I just went for it. After wards, I will keep them covered because it is still raining here and our backyard looks like Lake Shasta. It's hard to cover these - Anything fitted doesn't fit. So I use these throws I bought online. The problem with sofa throws is they get sloppy looking. I can't stand that look, but I don't want my freshly cleaned sofa and loveseat to get dirty. We always take them off when company comes. Or when I wash the throws which, having a dog and 2 cats is often. I like them to be clean and smelling nice. I've been a bit lazy lately - actually I just haven't been doing any work around the house, worth mentioning. What I have been doing, is going to the Gym to work out. Then I come home, and collapse.